Buongiorno principesse e principi! I hope we’re all still feeling uplifted from last night’s touching holocaust rom com! (erm…), and lashings of pizza and vino! MNFC newbie Sam welcomed what I think was the biggest crowd this year into his very spacious living room. Luckily the pizza and the TV were big enough to match the crowd. We’re just all waiting very eagerly to find out if the television in Lucy’s house is, in fact, even bigger than Sam’s – I’m sensing some the development of some technological rivalry here, so let me just point out that size doesn’t matter, it’s what you put on it that counts (erm…). And having a ‘sound bar’ is frankly bizarre, although it was exciting that we had our first Blu-ray moment! Sam confessed he had veered between a guilty pleasure and all-out chin-stroking art house cinematic essay, but finally settled for something between the two. Life is Beautiful had slapstick comedy and romance, but subtitles and hint of controversy too. Most excitingly, there were actual Fascists in it! (erm…) The slapstick comedy came courtesy of popular Italian comedian Roberto Benigni, who starred as Jewish waiter Guido, and also co-wrote and directed the film. The first half of the film follows Guido as he meets, falls in love with and woos Dora, a beautiful school teacher played by Benigni’s real life wife, Nicoletta Braschi. The couple marry, and go on to have a son, Giosuè, played by possibly the cutest child actor in the history of cinema. Benigni’s skill at physical comedy made for laugh out loud moments, helped along by the fact that the sound of words – even though they were in Italian and therefore incomprehensible to majority of us – added to the comedy. “Funghi fritti fritti fritti”, anyone? 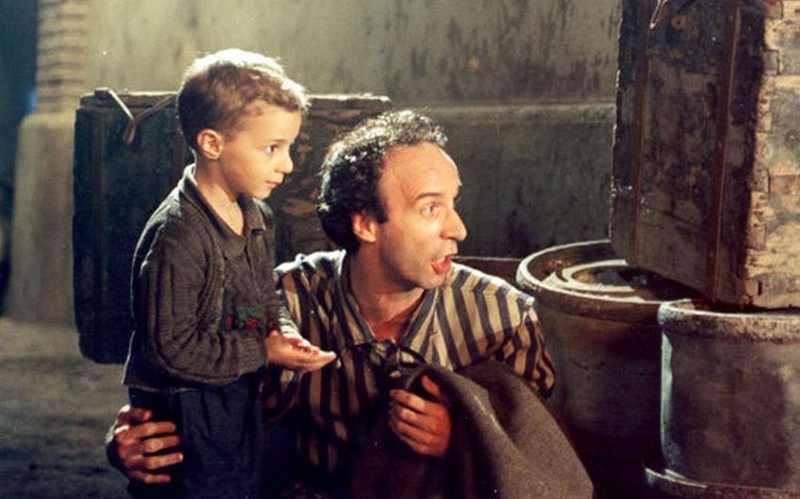 The controversy was provided by the second half of the film, in which Guido and family are taken to a Nazi concentration camp, and Guido attempts to protect his son from the horror of the camp by pretending that the whole thing is a game arranged for Giosuè’s birthday. Many critics thought that it was inappropriate to approach the holocaust from a comedic perspective, whereas others praised its attempts to show the nature of the human spirit and the power of love; even Jewish audiences were divided in their opinions. There’s no doubting where this particular critic stands though, calling it “unforgivably obscene”. This negative response to the film appeared to do no lasting damage, as it went on to be nominated for seven Academy Awards including best picture, and won three. Benigni won the statuette for Best Actor – the first time the award had gone to someone in a foreign language film – though it was his reaction to winning Best Foreign Language Film that was most memorable. At the end of the evening it was clear that several of the film fascists have a future writing B-movies. As well as Comrade Love and I attempting to write the next logical step in the Home Alone franchise, Comrade Okereke imagined the Hollywood remake of Life is Beautiful, with Guido transforming into some kind of skinny ninja superhero who overpowers the Nazi guards and single-handedly saves the day! Any suggestions for a title for that film? Would even Jon be able to see parallels with The Bicycle Thieves in it?! So, principesse e principi, the next session is the 2nd annual Halloween Dem-on-ocracy. You’ve seen the shortlist; all you have to do is vote. After that I believe we are due to meet again on 19th November, when I would like to suggest Matt as a host (work permitting) as he has not hosted a single MNFC this year!